It's that time of year again when Summer and Winter start warring. One day it's warm and sunny, the next day is cold and wet--somedays that occurs just a few hours apart as the opposing seasons duke it out around us. Being a trapper means you never get the day off. Each set trap has to be tended, rain, shine, wind or whatever side of the battle you are on. In the last week I've been in a tee shirt and slickered up in a Gore-Tex shell against the wind driven rain. These photos were taken of two coyotes caught in the same spot on back to back days. Note the shirt sleeves, then the hoody. One could say it's part of the fun, but that's more apt to come on a sunny, warm day. One could also say it's part of the challenge, but that would likely come on a wet, miserable day. The reality is it's the way of the world and being out in it gives one more appreciation for it - as well as more appreciation for the warmth of home. I've been seeing more deer lately. Perhaps it's the harvest, mowing down the tall corn. Perhaps it's the onset of the breeding season, making the deer feel more frisky during the daylight hours. Another sign of the changing seasons. When people think of "wild" mushrooms in the Midwest, most think of the Morels that pop up in secluded locations in early spring. There's nothing wrong with Morels but the hunt for them is as fun as the picking and eating. There's another kind, however, unknown to most, easy to identify and oh-my-golly how much better and versatile than Morels. 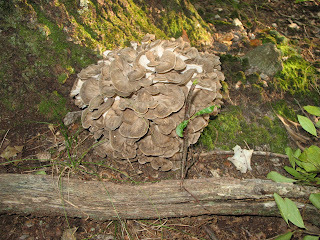 It goes by many names - hen-of-the-woods, hen and chicks, rams-head, sheepshead, cauliflower and others. Japanese 'shroomers call them Maitaki. 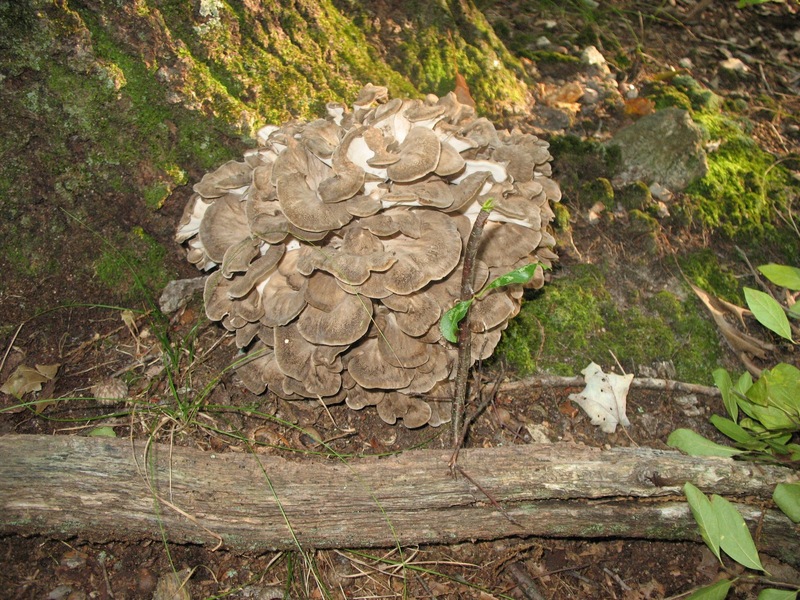 Shown here, a typical, volley-ball-sized Hen-of-the Woods. I once heard Alton Brown describe them as second only to truffles as far as being flavorful. This was a bumper year. I've had to alter the places and routes I travel on my coyote trap line this year because of the late harvest, but those detours have taken me to new woodlands and I've turned my travels into mushroom hunting expeditions. Success! I've located several new oak trees that shelter these treasures. And, because they are perennials, they'll likely be another one there, next fall. A big one may weigh 10 pounds or so, a small one is a pound and most are about the size of a volley ball and weigh 4 or 5 pounds. Another of Alton Brown's quotes is very appropriate - "Good Eats." It's been a busy week. I started my coyote trap line on opening day, October 15 and after a week, I'm at my minimum goal which is to catch one or two coyotes each day. There was one day and night of 50 mile per hour winds and one day of constant rain. Neither condition is conducive to a successful line. Still, with one day of zero and another with 2 catches, I'm progressing. Farm harvest is significantly behind and is presenting plenty of problems. Most notable are the "great" places to set traps which have unharvested corn or soybeans. The other thing are formerly "great" spots which have gone dead, presumably because of their proximity to standing crops. The above photo is the coyote I caught today in a trap I set just yesterday. I'll be extending my line to new areas in the next few days to see what they may bring. "By day he’s a mind mannered citizen, by night a super crime fighter!" Some think that describes me. Not the super crime fighter or even making a daily switch to an alter-ego. "By summer, Mike’s a hard-charging charter boat captain, focused on all things boating and fishing on Lake Michigan. By winter he’s a dedicated trapper, controlling and harvesting the local populations of coyotes, raccoons, skunks and possums for fur, food and fun." So it might seem. And I’ll be the first to admit I’ve seldom been one to "dabble" in the activities I do. More often I take a sniff, then dive in headfirst. So I’ve scaled back my Brother Nature blog for the "non-fishing" season and started this one. I’ll try to give you a peek or two into what I call my outdoor world. I have no set direction, agenda or idea of where this will go, so jump on board and let’s see where we go!